Inversion injuries involve about 25 % of all injuries of the musculoskeletal system and about 50 % of these injuries are sport-related. This article reviews the acute lateral ankle injuries with special emphasis on a rationale for treatment of these injuries in athletes. A narrative review was performed using Pubmed/Medline, Ovid and Embase using key words: ankle ligaments, injury, lateral ligament, ankle sprain and athlete. Articles related to the topic were included and reviewed. It is estimated that one inversion injury of the ankle occurs for every 10,000 people each day. Ankle sprains constitute 7–10 % of all admissions to hospital emergency departments. Inversion injuries involve about 25 % of all injuries of the musculoskeletal system, and about 50 % of these injuries are sport-related. The lateral ankle ligament complex consists of three ligaments: the anterior talofibular ligament, the calcaneofibular ligament and the posterior talofibular ligament. The most common trauma mechanism is supination and adduction (inversion) of the plantar-flexed foot. Delayed physical examination provides a more accurate diagnosis. 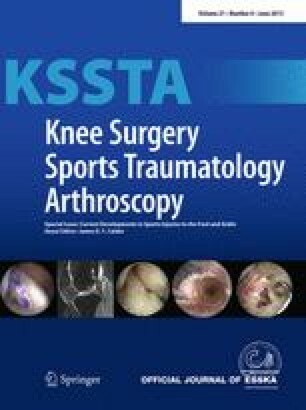 Ultrasound and MRI can be useful in diagnosing associated injury and are routine investigations in professional athletes. Successful treatment of grade II and III acute lateral ankle ligament injuries can be achieved with individualized aggressive, non-operative measures. RICE therapy is the treatment of choice for the first 4–5 days to reduce pain and swelling. Initially, 10–14 days of immobilization in a below the knee cast/brace is beneficial followed by a period in a lace-up brace or functional taping reduces the risk of recurrent injury. Acute repair of the lateral ankle ligaments in grade III injuries in professional athletes may give better results. The authors did not receive any outside funding or grants in support of their research for or preparation of this work. Neither they nor a member of their immediate families received payments or other benefits or a commitment or agreement to provide such benefits from a commercial entity. No commercial entity paid or directed, or agreed to pay or direct, any benefits to any research fund, foundation, division, centre, clinical practice or other charitable or non-profit organization with which the authors, or a member of their immediate families, are affiliated or associated.